A role can represent an operational entity or a job title, such as Invoice Manager or Financial Department. Users or groups can be assigned to one or more roles. 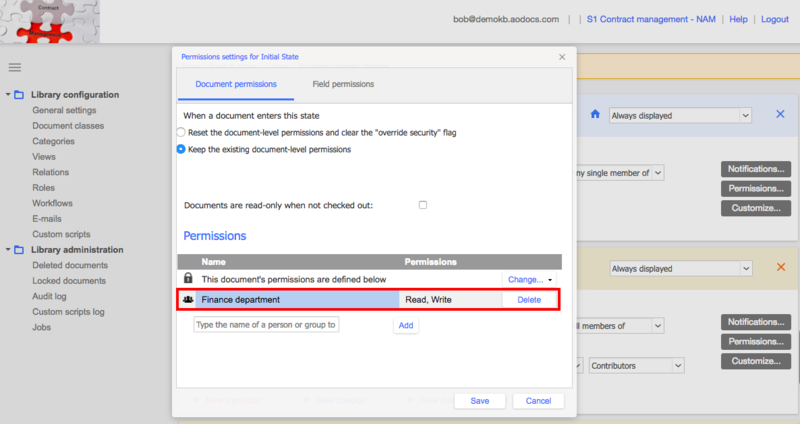 Permissions can then be assigned to roles by library administrators (for example, the permission to administer a library, to create documents in a library, or to perform certain workflow actions). Administrators are granted write, read, share, and delete permissions to all documents in the library of which they are administrators. Administrators can also configure library administration settings. Tip: Administrators also receive and manage the sharing requests forwarded by the storage account. Administrators can delegate the management of sharing requests to a specific role. To implement this delegation, you can contact our support team. Contributors can be given the permission to create, edit, delete and share documents in the library. Being a member of the contributor role at the library level doesn't grant write permission on all documents, but rather makes it possible to be given this permission. Note: You can't grant a user edit permission on a document if the user is a reader in the library — the user must be a contributor. Readers can be given the permission to read documents in the library. Being a member of the reader role at the library level doesn't grant read permission on all documents, but rather makes it possible to be given this permission. - All contributors are automatically readers. - You can't grant a user read permission on a document if the user isn't defined in the library. You can define administrators, contributors and readers in the library security settings. A predefined document role contains only one person and can't be updated manually. Last update author: the user who performed the last update on a document. This role is dynamic. Version creator: the user who created the last version of the document. This role is dynamic. Note: Users can create versions manually or by workflow actions. Users can create a new versions directly or through a check-in. In addition to predefined roles, administrators can configure custom roles in the Roles section of the library administration interface. Custom roles are specific to each library and are not shared between libraries. Tip: As best practice, if you are using Google Groups you are recommended to associate each AODocs custom role with a single dedicated Google Group to avoid unnecessary access control list (ACL) synchronization in your Google Drive each time you add or remove users from the role. What about commenters? Is this role available like in Drive? Yes, you can assign a role the possibility to "Comment". It depends on the type of library and where you want to provide the permission (at the workflow state level,..).